Half of the stores on the top 10 list are in Cedar Rapids. The other five are in Waterloo, Council Bluffs, Fort Dodge, Mason City and Des Moines. Two lottery machines sit just inside the door of Jim’s Foods, 812 Sixth St. SW in Cedar Rapids. Photo taken July 27, 2015. The top locations were ranked by the amount of sales in fiscal 2015, which ended June 30. Iowa’s median household income is $52,229. While not more likely to gamble, people with low incomes statistically are less likely to seek treatment for gambling addiction, an Iowa Gambling Treatment Program survey reported in 2013. Moreover, Iowans with a salary of less than $50,000 in annual household income were least likely to know about gambling treatment programs in Iowa, according to an Iowa Gambling Treatment Program 2013 report. The other three areas on the top 10 lottery sales list had median household incomes within $3,000 of Iowa’s median household income. All 10 are in areas where median household incomes ranges from $40,969 to $55,878. The poverty level for a two-parent and two-child household is $24,008, the U.S. Census Bureau reports. An IowaWatch analysis of Iowa Lottery, Census and American Community Survey data showed ticket sales in each of the top 10 stores at more than half a million dollars each, averaging $673,473 in fiscal 2015. 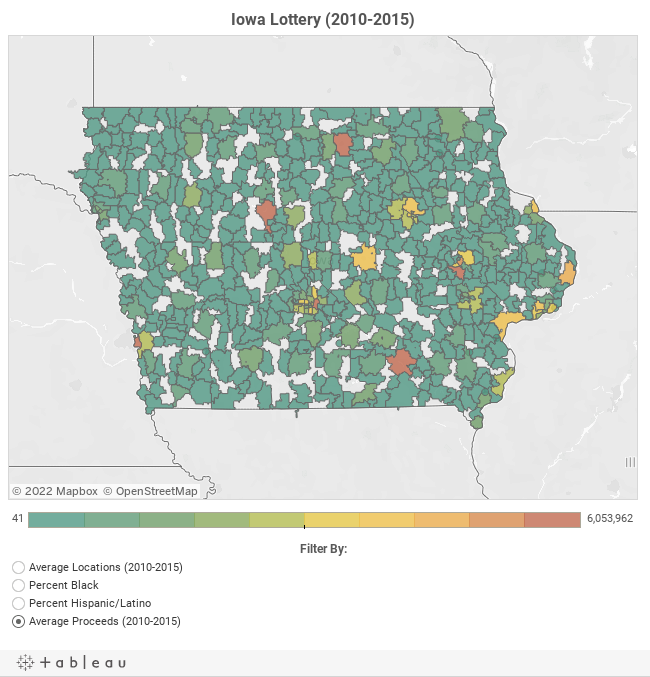 IowaWatch analyzed the data by overlaying Iowa Lottery data on retailers’ ticket sales and U.S. Census data on Iowa zip code demographics. The income range grabbing the attention of addiction experts is $25,000 to $49,999, according to the Iowa Gambling Treatment Program’s report on Iowans’ attitudes and behaviors toward gambling. Iowans making $75,000 or more annually were the most likely to gamble, while those making $25,000 or less were the least likely to gamble, the report stated. However, the report showed those earning less than $25,000 annually were more likely to show one or more symptoms of problem gambling. Iowans who have an income between $25,000 and $49,999 were the most at risk for problem gambling and were second-most likely to have gambled in the last 12 months, according to the 2013 report. The first and 10th top selling lottery ticket retailers are in southwest Cedar Rapids while northern Cedar Rapids has another three. The southwest Cedar Rapids area with the 52404 zip code, with the first and 10th top selling locations, has a median household income of $45,973, according to the 2013 American Community Survey. The two locations – both of them HyVee stores – combined for more than $1.4 million in ticket sales in fiscal 2015. A northwest Cedar Rapids area with a 52405 zip code has the third and ninth top selling locations in fiscal 2015 – a HyVee and Guppy’s on the Go store – with more than $1.3 million in ticket sales combined. Southwest Waterloo, with the 50701 zip code and fiscal 2015’s sixth top retailer, has a median household income of $47,900. The HyVee there generated $614,288 in proceeds. The area in Des Moines where the fifth top retailer is located has a median income $44,744 and the area next to it has an median income of $32,256. The Council Bluffs location with the seventh highest ticket proceeds has a median income of $40,969, while the state’s eighth highest Iowa Lottery retailer is located in Mason City, an area with a slightly higher median of $42,458. While the Iowa Gambling Treatment Program report found those with a lower median household income were least likely to know about treatment programs, it also found that people with four or more years of college were 36 percent less likely than those with a high school diploma or less education to play the lottery. The study also found Iowans in bigger cities or towns were less likely to know about state-funded gambling treatment programs, as well as those earning less than $25,000, the 2013 state gambling treatment report said. The Iowa Lottery is a state-run program started in August 1985, a time when the state’s economy took a dip. Up to 28 cents from each $1 spent on the lottery goes to benefit state programs. Less than 1 percent goes to benefit the Iowa Veteran’s Trust Fund. The rest pays for lottery prizes and operational costs, according to proceeds data provided by the lottery. The Iowa Lottery brought in almost $325 million in fiscal 2015, according to a report released by the lottery on July 30. Of that, almost $72.4 million went to the state general fund. The Iowa Veterans Trust fund received more than $2.1 million, Mary Neubauer, the lottery’s vice president for external relations, said. Top retail locations are in business districts with heavy consumer traffic, Neubauer said. Many higher-income neighborhoods are not located in business districts so customers travel from their homes to local stores and gas stations in business districts they frequent for groceries, gas or regular errands, she said. However, Danielle Backin, gambling treatment and prevention educator at Pathways Behavioral Service in Waterloo, said she sees more gambling advertisements in the lower-income downtown Waterloo than in other neighborhoods. “I would say that neighborhoods where there is a lot of low income, you do see a lot of marketing, not specific to the lottery, but so many other things. They may not have advertising literacy; they may not understand how it’s affecting them,” Backin said. 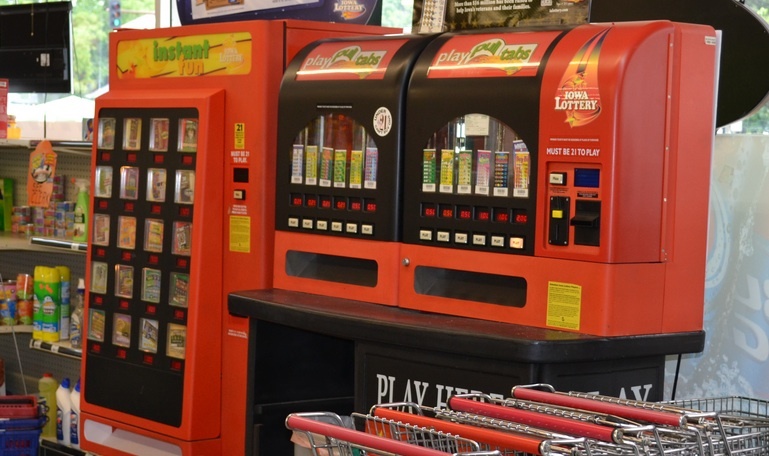 Kristie Bell, director of communications for Kum & Go, said all Kum & Go locations sell lottery tickets because Kum & Go customers want that service, but Kum & Go does not have special promotions to advertise the selling of Iowa Lottery tickets in stores. Tara Deering-Hansen, vice president of communications at HyVee’s corporate headquarters in West Des Moines, declined comment. The manager at Cedar Rapids’ Guppy’s on the Go contacted by IowaWatch referred calls to corporate spokespeople, who did not return calls. 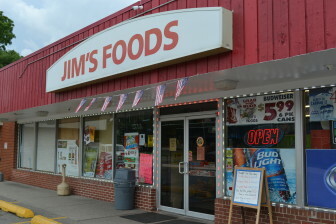 Frances Siddique said she sees some customers come into her store she co-owns, Jim’s Foods on Sixth Street SW in Cedar Rapids, primarily for lottery tickets. Customer Medardo Valdez, 50, won around $20 after purchasing a scratch ticket at Jim’s Foods, 812 Sixth St. SW in Cedar Rapids, on July 27, 2015. 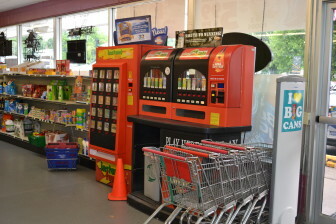 Though it is not a top 10 lottery retailer, Siddique’s store is the southwest Cedar Rapids’ 52404 zip code with the median household income of $45,973. Her store has two lottery machines and sells over-the-counter pull tabs and scratch tickets. Siddique, 54, said Jim’s Foods sells tickets because her customers want them. Iowa Lottery data shows proceeds from the location were $93,259.50 in fiscal 2015, down from $114,980 in fiscal 2014. Cheissia Malloy, 28, said she recently moved to the Sixth Street SW neighborhood with her infant daughter and does not buy lottery tickets often but would if she had enough money to do so. The hope of winning money that will solve her problems keeps Malloy and her friends interested in the lottery, she said. “I’m trying to raise her on $400 a week,” Malloy, who declined to say how much she earns working, said of her daughter. “I would buy one once a day if I could,” she said. 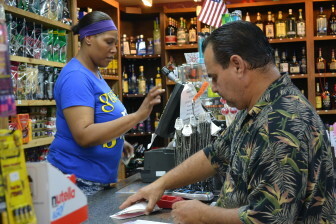 Siddique said she believes her customers don’t understand how tiny the chances of winning a Powerball jackpot are. Those odds will be one in 292,201,338 in October, according to the Iowa Lottery. Jim’s Foods, 812 6th St SW, sells lottery tickets and pull-tabs. The store, pictured on July 27, 2015, is located in the Cedar Rapids’ zip code 52404, which has a median household income of $45,973. Siddique said the hope of winning big and the small money prizes they win periodically can be addictive, but she understands why people buy tickets. Eric Pruess, program manager for the Iowa Gambling Treatment Program, said lottery tickets are a tiny part of problem gambling in Iowa. About one of every 10 people seeking gambling treatment says his or her main way of gambling is through the Iowa Lottery, Pruess said. More than half of Iowans participated in some Iowa Lottery games in 2013, the 2013 report by his treatment program report. Casino gambling is a far larger problem, Pruess said. “Those who do just lottery tend to have problems related to gambling, but there still is that small percentage that do. There tends to be a much larger percentage of the population that has a higher percentage at risk for casino gambling,” Pruess said. Pruess said a more serious problem is clinically-classified gambling disorders, Pruess said. Pruess said some lower-income Iowans who seek treatment have a disconnect: they think a lottery ticket might bring them out of debt even as they buy so many tickets they spiral into debt. Treatment is available through 1-800-BETSOFF and the Iowa Gambling Treatment Program, and financial assistance is available through the state for those who seek treatment but cannot afford it. Neubauer said a healthy way to play the lottery exists: don’t expect to win. Treat the lottery like occasional expenses such as going to a movie or out to dinner, she said. “You can’t have the big jackpots without the long odds. That’s why the ‘play responsibly’ aspect is such an important component of our messaging. The lottery truly should be something you do just for fun,” Neubauer said. However, Iowa Lottery advertisements promote the message that anything can happen> and dreams really do come true for Iowans who play the lottery. Pruess said people with gambling habits need to understand the irrationality of depending on winning prizes from the lottery. They have to gain self-control and realize the losses are greater than the gains, something Pruess said he understands as a recovering problem gambler who saw the consequences of his behavior. This IowaWatch story was published in the Mason City Globe Gazette, The Courier (Waterloo-Cedar Falls, IA) and Des Moines Register under IowaWatch’s mission of sharing stories with media partners. To learn how IowaWatch’s nonprofit journalism is funded and how you can support it, go to this link. Iowa has resisted a trend adopted by other states of funneling lottery proceeds straight into public education. Yet, a myth that the Iowa Lottery, which marks its 30th anniversary milestone this year, does is so prevalent that Mary Neubauer, Iowa Lottery’s vice president of external relations, said she continually has to clarify the misconception.